300 Beacon is located on the north side of Beacon, between Exeter and Fairfield, with 298 Beacon to the east and 302 Beacon to the west. 300 Beacon was built 1869-1870 for real estate dealers Samuel Horatio Whitwell and his brother, Henry Whitwell, for speculative sale, one of two contiguous houses (300-302 Beacon) designed as a matching pair. 302 Beacon was significantly remodeled in 1932. Henry Whitwell purchased the land for 300 Beacon on May 21, 1870, from the Boston and Roxbury Mill Corporation. S. Horatio Whitwell purchased the land for 302 Beacon on the same day. In both cases, the houses had been built before they took title to the land. Click here for an index to the deeds for 300 Beacon. On September 30, 1870, 300 Beacon was purchased from Henry Whitwell by Olivia Howard (Brown) Griffith, the wife of Meriweather Hood Griffith, a shipping merchant in the East India trade. They previously had lived with Olivia Griffith’s parents, William and Lucy (Church) Brown, at 4 Commonwealth. They continued to live at 300 Beacon in 1876, but had moved back to 4 Commonwealth by 1877. On September 15, 1876, 300 Beacon was purchased from Olivia Griffiths by George Keith Guild and his wife, Josephine (Hammond) Guild. 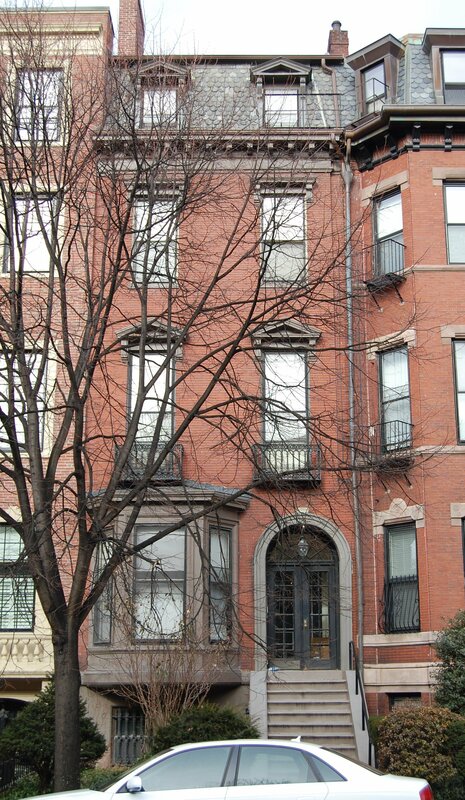 They lived at 30 Chester Square and may have lived briefly at 300 Beacon before moving to 22 East Brookline in 1877. During the 1876-1877 winter season, 300 Beacon was the home of banker Harry A. Rogers and his wife, Mary T. (Brigham) Rogers. They previously had lived in Grantville, and by 1878 they were living there once again. By 1880, they were living at 130 Newbury. On May 10, 1877, 300 Beacon was acquired from George Guild by Edward Burgess. He married in June of 1877 to Caroline Louisa Sullivant and they made 300 Beacon their home. He previously had lived at 62 Beacon. Edward Burgess was secretary of the Boston Society of Natural History and an instructor of entomology at Harvard. In the mid-1880s he became a designer of sailing yachts. Among the yachts he designed were the Puritan, which won the America’s Cup in 1885, and the Mayflower, which won the America’s Cup in 1886. In 1885, Caroline Burgess’s brother, Allen Sullivant, lived with them. The Burgesses continued to live at 300 Beacon during the 1885-1886 season, but moved thereafter to 443 Marlborough. On March 17, 1886, 300 Beacon was purchased from Edward Burgess by Thomas Riley. He and his wife, Margaret (McCormick) Riley, made it their home. They previously had lived at 21 Chester Park. Thomas Riley was a lawyer and local political leader. In 1897, he was an unsuccessful candidate for mayor. Living with them at 300 Beacon from about 1895 was Charles Francis Smith, Thomas Riley’s nephew and a lawyer at the same office address (probably in the same practice) as Thomas Riley. Charles Smith graduated from Harvard Law School in 1894. He was the son of David Houston Smith and Bridget C. (Riley) Smith, Thomas Riley’s sister. Thomas Riley died in November of 1907. Margaret Riley and Charles Smith continued to live at 300 Beacon during the 1908-1909 winter season. Charles Smith married in January of 1909 to Agnes O’Shea. After their marriage, the lived at 18 Princeton Avenue in Allston. Margaret RIley moved at about the same time to The Carlton at 1134 Boylston. On July 27, 1909, 300 Beacon was acquired from Margaret Riley by architect Augustus Neal Rantoul. He and his wife, Matilda Charlotte Palgrave (Chetwynd-Talbot) Rantoul, made it their home. They previously had lived in Salem. They continued to live at 300 Beacon during the 1922-1923 winter season, but moved thereafter to Ipswich. By 1930 they had retired to Montecito in Santa Barbara County, California. On May 3, 1923, 300 Beacon was acquired from Augustus Rantoul by Miss Margaret C. Cummings, daughter of Charles Amos Cummings. 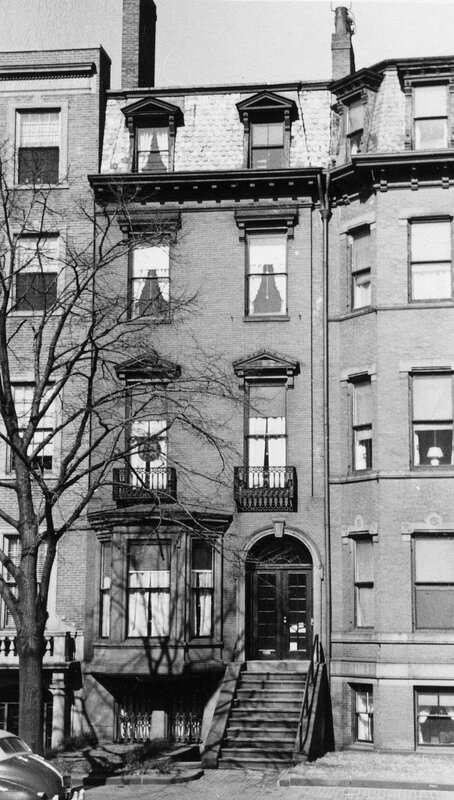 She had lived at 230 Clarendon with her widowed mother, Margaret Josephine (Kimball) Cummings, until Mrs. Cummings’s death in July of 1922. She also maintained a home in Topsfield. Margaret Cummings did not move immediately to 300 Beacon and may have been traveling abroad. During the 1923-1924 winter season, 300 Beacon was the home of Henry St. John Smith and his wife, Constance (Wharton) Smith. They previously had lived at 169 Beacon with Constance Smith’s mother, Susan C. (Lay) Wharton, the widow of William Fisher Wharton. Henry St. John Smith was vice president of the Atlantic Radio Company, wholesale distributors of RCA radios. 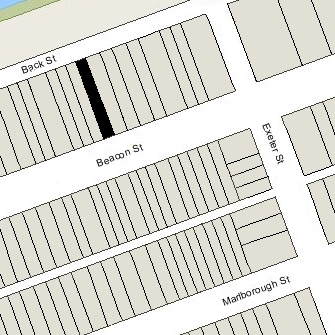 By the 1924-1925 season, they had moved to an apartment at 199 Marlborough. 300 Beacon was not listed in the 1925 Blue Book. By the 1925-1926 winter season, Margaret Cummings had made it her home. In November of 1961, she applied for (and subsequently received) permission to remodel the house to install an elevator shaft from the basement to the third floor, large enough for an elevator which could hold a wheel chair. Margaret Cummings continued to live at 300 Beacon until 1962. On September 29, 1962, 300 Beacon was purchased from Margaret Cummings by Dr. Israel Diamond, a physician, and his wife, Thelma Beatrice (Greenberg) Diamond. They lived in New York City. In November of 1962, they applied for (and subsequently received) permission to convert the house from a single-family dwelling into five apartments. On March 28, 1973, they transferred the property into Thelma Diamond’s name. At that time, they were living at 54 Brimmer. On April 26, 1988, Thelma Diamond transferred the property to the Thelma B. Diamond Realty Trust, with herself as trustee. Israel Diamond died in March of 1990 and Thelma Diamond died in January of 1999. 300 Beacon continued to be owned by the Thelma B. Diamond Realty Trust. 300 Beacon remained an apartment building in 2016.